The Java trim Method is one of the Java String Method which is used to remove the empty spaces from both Right hand side and Left hand side of a string. In this article we will show you, How to use String trim in Java Programming language with example. The basic syntax of the string.trim in Java Programming language is as shown below. If the String_Object represents an empty character sequence then reference to this String_Object is returned. If both the first & last character of the String_Object have codes greater than ‘\u0020’ (the space character) then reference to this String_Object is returned. When there is no character with a code greater than ‘\u0020’ (the space character) then an empty string is created and returned. The Java string.trim Function will return the copy of this string with leading and tailing white spaces removed. The Java string trim method is used to remove the leading and tailing empty spaces or white spaces. 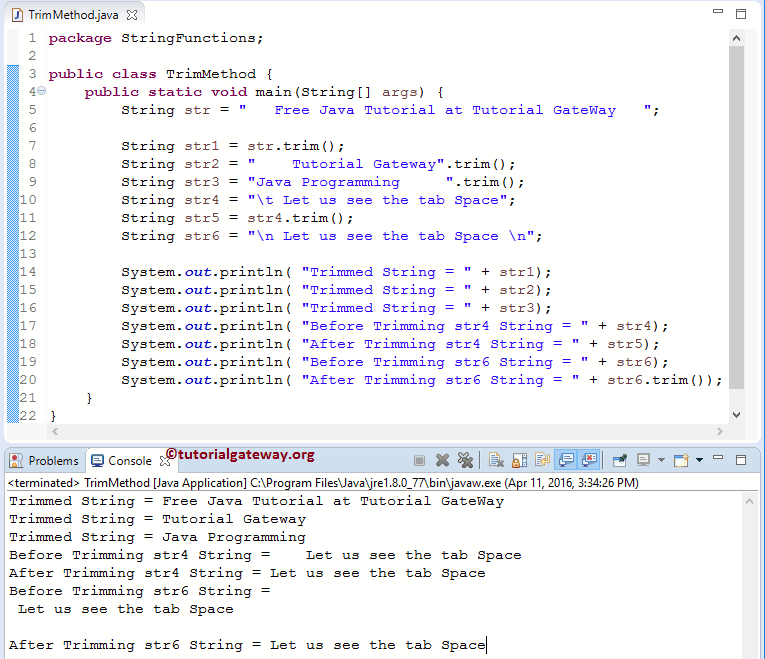 This Java program will help you to understand the string.trim method. Lastly we used the System.out.println statements to print the trimmed data (output).